The Paria Canyon-Vermilion Cliffs Wilderness Area, part of the Vermilion Cliffs National Monument, encompasses one of the finest canyons in the American Southwest and one of the most spectacular slot canyons in the world, the Buckskin Gulch. It also includes the scenic Coyote Buttes, North and South Districts. 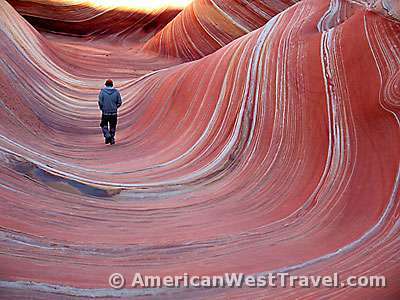 Coyote Buttes North includes the famous Wave formation, one of the world’s most well-known and surreal landscapes. Enjoy the unparalleled wondrous beauty found throughout the Paria Canyon-Vermilion Cliffs Wilderness Area. Please view the Bureau of Land Management (BLM) video “Paria Canyon-Vermilion Cliffs Wilderness, A Lasting Legacy” by clicking on the video, right. This Trail Guide offers detailed information for hikers and backpackers wishing to visit Paria Canyon, the Buckskin Gulch, Coyote Buttes North and the Wave, and Coyote Buttes South. It includes printable maps and trail guides, road access information, links and information for permits, and detailed narratives from my personal experiences in each place. You’ll find no designated trails, developed campsites, signs, or facilities inside the wilderness boundary. The terrain is rugged and hiking conditions can change with the weather. Hikers should be in good physical condition and know how to navigate in a primitive backcountry setting. Photo, left: The author strolling through the Wave. Shows the area roads and locations of the trailheads for White House, Buckskin Gulch, and Wire Pass. The only service provider close to the trailheads is the Paria Outpost and Outfitters which is on US-89 just west of the Paria River. It offers limited food, lodging (one room), and camping but has hiker services such as car shuttles, guided hiking trips, and other tours which also cover the Grand Staircase-Escalante National Monument. There is also a VRBO owner vacation rental available in nearby Big Water, Utah. Click on any of these hotel links to check for availability or to reserve any room(s). 132 Guest Rooms on four floors (elevator). Expanded continental breakfast, heated outdoor pool open April through October, exercise facility, 24-hour front desk, safe deposit box, free parking, 100% non smoking, interior corridor, High-speed Internet access. 103 Guest Rooms on three floors (elevator). Deluxe continental breakfast, heated outdoor pool & spa open April through October, exercise facility, 24-hour front desk, safe deposit box, free parking, 92 non-smoking rooms, interior corridor, High-speed Internet access. 90 Guest Rooms on three floors (elevator). Free buffet breakfast, complimentary newspapers, and coffee/tea makers, in-room microwaves and refrigerators, outdoor pool, exercise facility, free parking, 100% non-smoking, interior corridor, free wireless high-speed Internet access. 129 Guest Rooms on three floors (no elevator). Expanded continental breakfast, heated outdoor pool, exercise facility, free parking, some non-smoking rooms, interior corridor, High-speed Internet access. When you are traveling in Southern Utah, stay with Holiday Inn Express and enjoy our spectacular scenery. Our hotel in Kanab, Utah is close to seven major national parks and Lake Powell. Leisure travelers looking for lodging near Zion National Park or Bryce Canyon will find our location ideal. 80 Standard one-bedroom units, some with whirlpools, on three stories. Smoke free premises. Heated Indoor Pool, Hot Tub, Health/Fitness Center On-Site, Complimentary breakfast, Free wireless internet. This great Southern Utah hotel is perfect for outdoor sports enthusiasts and traveling families! When visiting through the crossroads of Southern Utah, travelers know to stay at the Best Western Red Hills! This clean, comfortable inn boasts amenities such as an outdoor heated pool, on-site spa and a daily continental breakfast. Comfort and quality extend to every comfortable guest room that features cable television, a refrigerator and a coffee/tea maker. 75 units on 2 floors. Heated outdoor pool, whirlpool, free high-speed internet, free continental breakfast. There are three lodges located on Highway 89-A within ten miles of the turnoff to Lees Ferry. Hotels range from rustic to modest with limited amenities. Their restaurants serve modest and inexpensive fare. 1 mile west of Colorado River, at turnoff to Lees Ferry. Center of activity in the area. 60 rooms, 8 suites, apartments with kitchen for up to 6 people. Restaurant is modest. Has a fly shop, grocery store and gas station. Also, Camper Services, such as showers, phones, and laundry. Phone is (928) 355-2225 or (800) 726-1789. 4 miles west of turnoff to Lees Ferry. 10 rooms, no TV. Restaurant is the best of the three. Bar stocks about 100 different types of beer and is lively in the evenings. Phone is (928) 355-2231. The Flyshop is adjacent and is best local source of fishing supplies. 9 miles west of turnoff to Lees Ferry. Locale is a little quieter and is famed for spectacular views. New section has very nice rooms which are slightly more expensive. Restaurant is modest but has a very nice outdoor patio. The lodge has a fly shop, grocery store and gas station. Phone is (800) 962-9755 or (928) 355-2261.